The Gilded Age: A Tale of Today? Join us for a book discussion series provided by the Maine Humanities Council in partnership with the Maine State Library. 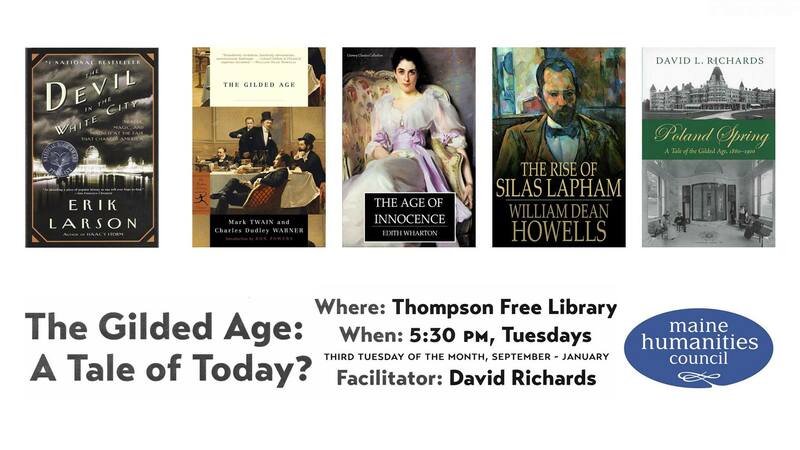 The series “The Gilded Age: A Tale of Today?” begins on September 18 and will be facilitated by author and historian David Richards. Books to be read and discussed include: “The Devil in the White City” by Erik Larson; “The Gilded Age” by Mark Twain & Charles Dudley Warner; “The Age of Innocence” by Edith Wharton; “The Rise of Silas Lapham” by William Dean Howells; and “Poland Spring: A Tale of the Gilded Age” by David Richards.